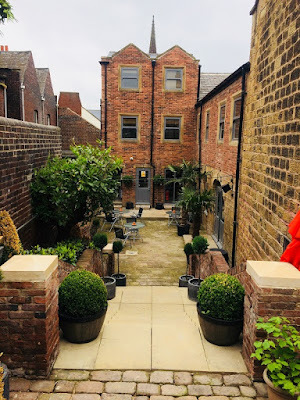 A Grade II listed "hidden gem" of a building in Rotherham town centre has reopened as as boutique hotel, bar and restaurant following a £500,000 revamp. Rotherham businessman, Mark Mcgrail, owner of SME Environmental Holdings and 1915 Bar & Bistro has already been recognised by Rotherham Civic Society for the restoration of the 18th century building into a modern and usable venue whilst retaining as much of the building's heritage as possible. The former office built in a Tudor Revival style is tucked away behind the High Street on The Crofts. It was famously occupied by George Wright & Company in the 1800's who designed and manufactured elaborate stoves and fireplaces. The site also formed lawyer's offices from 1777-1887. In the 1980's and 90's it was a bar but for the last 20 years the building has been abandoned, burnt by fire and infested with pigeons. Since the complete renovation and refit undertaken by Mark and his team, the hotel now boasts seven rooms all with en suites including a bridal suite that features a free-standing bath and a panoramic view over Rotherham. Each of the rooms pays homage to Rotherham's intriguing heritage being named after prominent individuals from Rotherham's past including Elizabeth Walker who was an ardent slavery abolitionist and Charles Sydney Gibbs who was tutor to the children of Emperor Nicholas II of Russia. 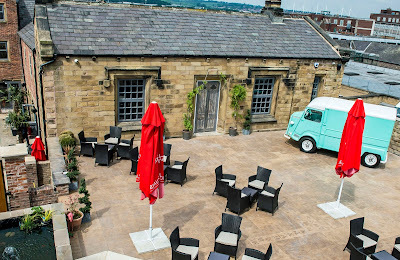 The newly refitted venue also hosts an 80-seater restaurant and kitchen which is available for wedding and party bookings and has three bars open to both residents and non-residents including a variety of craft gins, cocktails and more. The hotel also has three separate outdoor courtyards where diners and drinkers can enjoy the beautiful architecture of the building which is almost castle-like. 25 jobs have been created. Mark Mcgrail, owner of the George Wright Boutique Hotel, Bar and Restaurant, said: "Transforming the George Wright building from a completely rundown space into a boutique bar and hotel has been really challenging but extremely rewarding. The idea was to offer something a bit more upmarket in Rotherham town centre with the hope of boosting the town centre economy whilst offering something different to those both visiting the town and for those who already live here. "We have tried to retain as much of the heritage of the building as possible so it is great to be recognised for this. It is something that as a team we can be really proud of." The showcase redevelopment has been designed by Self and White design. Project architect Kevin Unwin said: "This is a brilliant regeneration project which is bringing new life to a wonderful building, creating jobs and providing something unique for the people of Rotherham. "We have, wherever possible, reinstated a lot of the original brickwork, natural stone and timber which has been left exposed to keep the feel of the building throughout. The internal fit out has also included the refurbishment of things like original fireplaces and front doors." Mark, who took on the property from Chris, added: "This is all about celebrating Rotherham's history and its people but also helping to create a strong future too. There have been over 250,000 expressions of interest and requests for more information online and so we are very confident that people really want this kind of high-quality establishment in Rotherham." But yet they don't have a website?